Или пример, как нужно реализовывать протокол обмена данными. Одна из трех функций от Siemens, обеспечивающих обмен по протоколу Open MODBUS/TCP. IDENT_CODE : STRING [18 ]; // Identification for licensing Please order your license with this identification string. STATUS:=W#16#A080; // Different instance DBs were used for the call of MODBUSCP in OB100 and the cyclic OB. ,DR := CPU_DATA // Order number of the module; String consists of 19 characters and a blank (20H); such as for CPU 314: "6ES7 314-0AE01-0AB0"
// characters. Shorter numbers are filled with B#16#00. // when a firmware update is performed. RDSYSST.RET_WERT<>-32638 AND // W#16#8082 SSL_ID is wrong or is unknown in the CPU or SFC. RDSYSST.RET_WERT<>-32637 // W#16#8083 INDEX wrong or not permitted. IF RDSYSST.RET_WERT=-32635 // W#16#8085 Due to a problem in the system, information is not currently available (for example, due to a lack of resources). ,EVENTN := W#16#A090 // The block MODBUSCP is not licensed for this CPU. This is a status information. The bit ERROR is not set. The Modbus communication runs without a license as well. IF STATUS = W#16#0 THEN STATUS:=W#16#A090; END_IF; // The block MODBUSCP is not licensed for this CPU. This is a status information. The bit ERROR is not set. The Modbus communication runs without a license as well. STATUS:=W#16#A085;// An error occurred during the license handling due to an invalid write access. IF WORD_TO_INT(id)<=0 OR WORD_TO_INT(id)>64 // An invalid value id is parameterized. Range of values is 1 to 64. IF WORD_TO_INT(sDataType)<0 OR WORD_TO_INT(sDataType)>4 THEN STATUS:=W#16#A07C; EXIT; END_IF; // An invalid value data_type_x was given. The value range is 0 to 4. IF i=1 THEN STATUS:=W#16#A07D; EXIT; END_IF; // Parameter data_type_1 is not defined. The parameter area _1 is the default area and must be defined. IF sStart_x>sEnd_x THEN STATUS:=W#16#A002; EXIT; END_IF; // The parameter end_x is less than start_x. IF tDbNr=W#16#0 THEN STATUS:=W#16#A019; EXIT; END_IF; // 0 is assigned to one of the parameters db_x while the according data_type_x is <> 0. DB 0 can’t be used; it is reserved for system functions. IF tDbNr=sIDB_Nr THEN STATUS:=W#16#A07E; EXIT; END_IF; // The DB number of db_x is identical to the number of the instance DB. IF tDbNr=WORD_TO_BLOCK_DB(sIDB_Nr).DW[sDATA_AREAS+2+(j-1)*8] THEN STATUS:=W#16#A010; EXIT; END_IF; // In the parameterized area db_1 to db_8 a DB number is used twice. STATUS:=SHL(IN:=INT_TO_WORD(i),N:=4) OR W#16#A000 OR INT_TO_WORD(j); // The parameterized areas overlap. Может быть у кого-то есть версии? Upd: это необходимо для формировании ошибки обращения к блоку данных, для подталкиванию к покупке лицензии :). Block checksum оригинального и восстановленного блока совпадает. 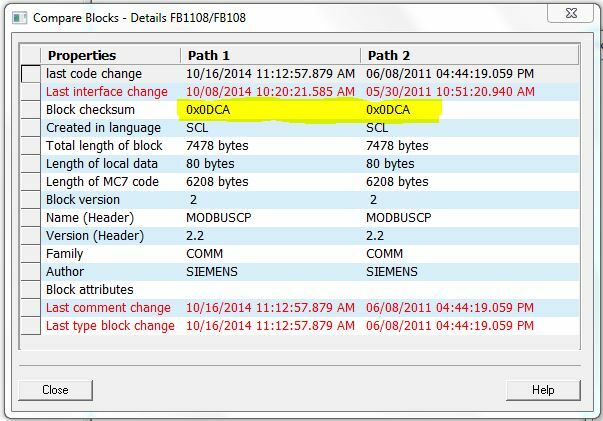 After compile, i don't have same block checksum as yours and siemens 0x0DCA.